The writer of Hell or High Water and Sicario, Taylor Sheridan took his turn in the director’s chair in his first big screen film, Wind River, and Sheridan showed that he is one of the hottest creative talents in movies today. Local hunter/tracker Cory Lambert (Jeremy Renner), who spends his time searching the woods of Wind River, a Native American reservation in Wyoming, for animals that are killing livestock of the natives. During one of his hunts, he stumbles across something unexpected. A body of a local Native American girl, raped, beaten and frozen to death. FBI agent Jane Banner (Elizabeth Olson) was sent into the reservation to investigate the crime and the pair team up to try and solve the mystery. 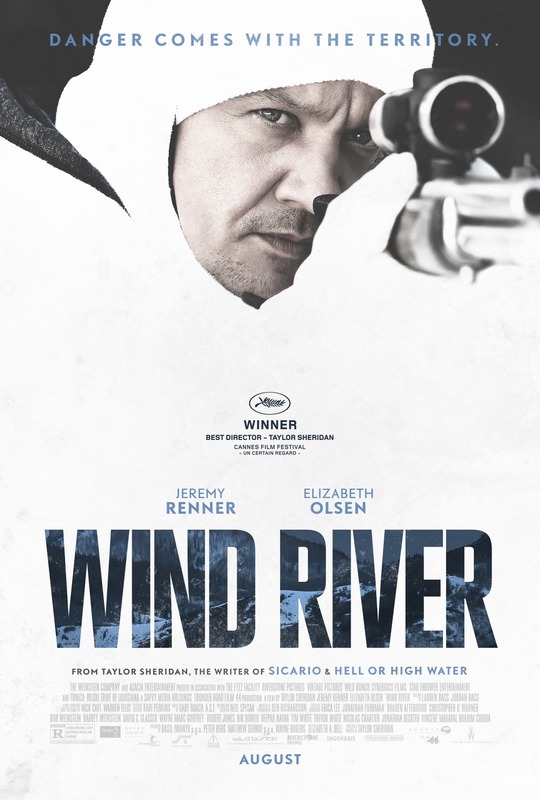 Wind River is a mystery story, but it also is not a mystery story. What do I mean by that? Well, the mystery is here, but it is not the center of this movie. The main driving force of the film is the elements and how Wind River is a perilous place to live. It is also very much a comment on the lives of the Native American who live in the area. The mystery is there too, but honestly it is peripheral to the rest of the film. Jeremy Renner is tremendous in this role, perhaps the best I have seen him. He was subtle and nuanced as this hunter who is dealing with his own tragic past while trying help solve the case. Elizabeth Olson is also wonderful in the role as the “fish out of water FBI agent, ” providing layers to her role, despite there not being as much development for her as there was for Renner. To both of their credits, I never thought of them as Jeremy Renner and Elizabeth Olson during the film, and, even more impressive, I never thought of them as Hawkeye and Scarlett Witch, either. However, perhaps the most standout performances were by a couple of Native American actors. The wonderful Graham Greene played the local sheriff Ben, who was entertaining and funny as he pessimistically quipped about the dower lifestyle with which the people had to deal. He reminded me very much of Gil Birmingham’s role in Hell or High Water. And the second top performance was by the aforementioned Gil Birmingham, who played the father of the murdered girl, Martin. He was amazingly heartbreaking and you could not help but feel the pain that he was dealing with. He also portrayed the anger perfectly of how society’s actions led to the loss of his daughter. I was fully engaged and engulfed by the movie for the first two acts of the film. I have heard some criticism that the early part of the film has pacing issues, but that was not my experience. I was all in on the film immediately. However, at the beginning of the third act, there is a flashback scene chronicling what exactly happened to the girl that felt so out of place in the narrative that we had had so far that it was very jarring. Though well done and traumatic, the flashback took me out of the film. Yet, immediately after the flashback, we get sucked right back in with one of the most real to life gunfights you will ever see. It is tense and dramatic and seriously painful to watch, and then the ultimate finale of the film is remarkably satisfying so the beginning of the third act only slightly derailed the film for me and I was right back on board after that. The scenes between Renner and Birmingham are some of the best scenes of the film, as these two men are able to connect over their common losses and it shines a light of humanity on the horrible situation life has placed them in. Wind River is a fantastic thriller with top of the line characters that has a voice to say about the treatment of Native Americans. It does so without being preachy. It just is. Renner and Olson are wonderful and Gil Birmingham could be Oscar worthy. The scenic backdrop of Wind River is a stark reminder of not only the beauty found in nature, but also how unforgiving and deadly nature can be. Even with the slight hiccup near the beginning of the third act, Wind River delivers big time.